The indent level of the field labels. 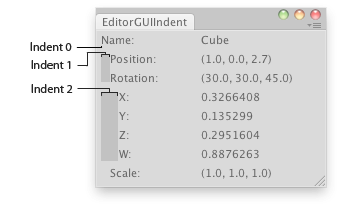 EditorGUILayout.LabelField will display the string given as an argument. This string can be displayed at a horizontal position, and the position changed by indentLevel. As indentLevel increases the labels will move right. Decreasing indentLevel will move labels to the left. Shows info of the selected object. To maximize future compatibility, do not make assumptions about what a specific indent level means, but instead just increase or decrease by one around blocks of controls that need to be more indented, as in the example above.